Nothing has created the buzz that Android-based tablets have over the past few months. With new offerings springing up all over the place, only Motorola’s Xoom and the original Galaxy Tab have really flipped people’s hair up. Walking the floor at CTIA, it’s hard to miss Samsung‘s booth. Not only is it one of the largest, sleekest ones at the conference, it’s also one of the most crowded. Why? Because everybody is clamoring to get their hands onto the new 8.9-inch and 10-inch Galaxy Tabs. It wouldn’t be mobile coverage if we didn’t talk about every aspect, and tablets are taking mobile by storm. While I loved the form factor of the original, 7-inch Galaxy Tab, I wasn’t so shot in the tail with its performance. The same holds true, somewhat, for the new 8.9-inch, but it’s notably better than the previous offering. First off, it’s worth noting that the new Tab feels a world better in your hands than the previous one did. While the early version of the Tab held the same feeling to the back as the Galaxy S line of phones, there’s a textured back to the new line and it’s remarkably good. Performance on the 8.9-inch tab isn’t stellar, but it’s very good. With the dual-core 1GHz processor, I’d have expected better, and I actually saw better performance out of the Xoom than I did with the Galaxy. Still, if you’re a fan of Samsung products, you’re going to flip over the new tab. It really is that perfect marriage of size and usability, even more so than what I felt with the 7-inch version. Using the tab, you’ll notice that there’s a new version of Samsung’s TouchWiz interface. It’s not overly heavy, but I have to wonder if it’s the reason why there’s a notable difference in the speed between the Tab and the Xoom. Moto’s overlay might simply be coded better. There are only WiFi versions, for now, which Samsung is promising to ship later this summer (I overheard both June and July dates). The pricing? 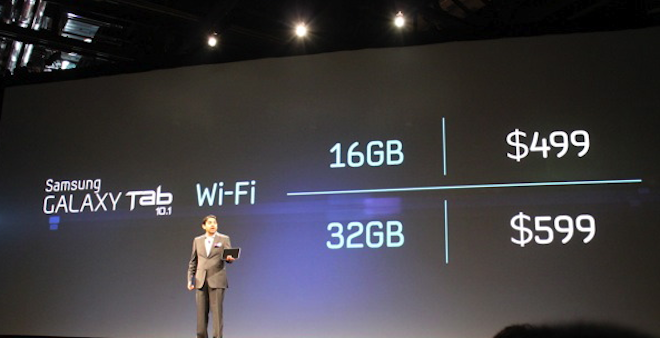 $499 for the 16 gig, $599 for the 32 gig. Did Apple just get its first real contendor for the tablet market? We’ll have to wait and see. At any rate, the new 8.9-inch Galaxy Tab is ranking high in my books, and that from someone who’s admittedly not an Android tablet fan.